I'm uber excited to post something about what kept us busy for the past few weeks (or months) aside of course from being burried with tonsa work at the office. After hours and hours of prepping and taping the walls, touching up the colors that bled under the painters tape, here are some pictures I am just so happy to share with everyone. We're not done yet but we're getting close. Stripes were only painted on one side of the wall (it's doubly hard for us to do the stripes because of our textured wall). The rest of the walls will be painted with brown and some light greenish shade so it wouldn't be too pink all over the room. So some pictures you'd see would just have the brown paint. After we tape the ceiling, then we can start painting the green. Hmmm, I'm really excited!!! Since we're almost about 75% done with the room, we started looking for cribs and beddings as well. No, not the whole set as what you see in the picture. We just got the 6-pc bedding set that came with the fitted sheet, comforter, dust ruffles, bumper, diaper stacker and window valence. I didn't want everything to be the same so we just got the basics :o) Oh, we got the light switch plate and matching border - but that's about it. I'm still thinking how to incorporate the "polka dots" on the wall so I don't want to overdo the animal theme of her crib bedding. We also found the best value crib - where else but from Ikea, haha :o) It's uber cheap ($130) so I was not really expecting too much when hubby suggested it. He was looking at the reviews for cribs and he found the Ikea Hensvik crib. So immediately, we went to Ikea and checked it. Wow, I was impressed! It's really sturdy for a convertible crib. It's not the prettiest crib out there, but hey, I was sold! 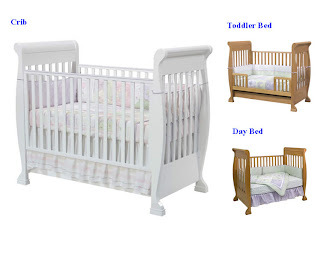 I sooo love white cribs... so clean looking and matches the bedding we chose perfectly! Now the one that I would have chosen is this cutie... however, for the price ($400), I think it's too much... not practical at all. Though it's really really really beautiful. So there... some summary of what's going on huh? Well, I'm on my 7th month, 3rd trimester.. so time's running real fast. I'm just scared that we wouldn't have the time to get things ready before our Mikka decides to come out. Anyways, I would like to apologize to my blogger friends that I haven't been able to blog hop and visit their respective blogs. I haven't even replied to those who left messages here. So sorry. Since I'm off for a 2 week vacation starting next week, I'd definitely make it up to you gals. wow, ang cute ng future room ni Mikka - luv the stripes! enjoy your vacay & keep healthy! take care! Galing rin ni hubby mo! Ang tyaga. berns, beautiful room with really awesome crib to toddler furniture!!! Where, oh, where did you find it???? :) Love it!! !